Win ZOG and the full Julia Donaldson & Axel Scheffler DVD Collection!!! 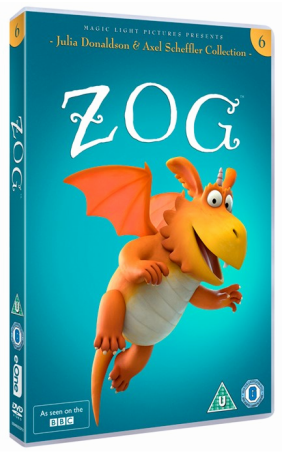 ZOG, the family- favourite hit film from Magic Light Pictures, the multi Oscar-nominated production company behind the Julia Donaldson and Axel Scheffler films, will be released on DVD on 11th February, 2019 on sale in all major retail outlets. Alongside the ZOG release, distributors Entertainment One will be releasing a Gruffalo 20th Anniversary Special Edition, which will include a set of 5 exclusive Gruffalo postcards to celebrate the book’s milestone anniversary, and all previous Donaldson and Scheffler titles will be re-issued as Collection DVD editions. ZOG is the story of a keen young dragon who wants to learn how to fly, roar, and breathe fire in his first years at Dragon School. He’s desperate to impress his teacher and win a golden star, but he’s accident-prone and each year he has to be helped by a kind young girl who patches up his bumps and bruises. Then in Year Four, he has to capture a princess – can the young girl help him with his trickiest challenge yet? Featuring Sir Lenny Henry as the narrator, Tracey Ullman as Madame Dragon, Hugh Skinner as Zog, Patsy Ferran as Princess Pearl and Kit Harington as Sir Gadabout. The Gruffalo is one of the most loved children’s stories of all time and tells the story of a mouse who is forced to rely on his wits for survival when confronted by three hungry animals. To scare them away he invents an imaginary monster with terrible teeth and terrible claws. But what happens when he comes face to face with his own creation? Featuring the voice cast of Helena Bonham Carter, Rob Brydon, Robbie Coltrane, James Corden, John Hurt, and Tom Wilkinson. The Gruffalo’s Child is the tale of the brave little Gruffalo who ignores her father’s warnings and tiptoes out into the snow in search of the Big Bad Mouse. She meets Snake, Owl and Fox but no sign of the fabled Mouse. He doesn’t really exist… or does he? Featuring the voices of Helena Bonham Carter, Rob Brydon, Robbie Coltrane, James Corden, Shirley Henderson, John Hurt and Tom Wilkinson. Room on the Broom is a magical tale of friendship and family about a kind witch who invites a surprising collection of animals to join her on her broom, much to the frustration of her cat. When the gang saves the witch from a fearsome dragon she rewards them with a magnificent new broom which has room for everyone! Featuring the voice cast of Gillian Anderson, Rob Brydon, Martin Clunes, Sally Hawkins, Simon Pegg, Timothy Spall and David Walliams. Join Stick Man on his incredible journey across the seasons as he runs from a playful dog, gets thrown in a river, escapes from a swan’s nest and even ends up on top of a fire. Will he get back to his family in time for Christmas? An exciting and heart-warming adventure with the voices of Hugh Bonneville, Rob Brydon, Martin Freeman, Sally Hawkins, Jennifer Saunders and Russell Tovey. The Highway Rat tells the tale of a ravenous rat who craves buns, biscuits and all sweet things. Tearing along the highway, he searches for sugary treats to steal, until his sweet tooth leads him to a sticky end! Featuring the voices of Rob Brydon, Frances De La Tour, Tom Hollander, Nina Sosanya and David Tennant, this is a swashbuckling adventure of biscuits and bandits the whole family will enjoy. ZOG and the Julia Donaldson & Axel Scheffler DVD collection is available on the 11th February!! !